Greetings. Do we know you? The Books tab in Author Central lists the books displayed on the Amazon.com Author Page. If any of the books listed have incorrect information or are not correctly assigned to you, it's easy to correct them using Author Central. When you join Author Central and manage your bibliography for the first time, it may take us 3 to 5 days to Create Your Author Central Account and build the Author Page. If you have written a book that doesn't appear in your bibliography and is available on Amazon.com, you can add it. On the Author Central Books tab, scroll to the bottom of your bibliography and click Add more books. In the Search field, enter the book title, ISBN, or author name and click Go. Once you've found the missing title, click This is my book below that book. If our catalog lists your name as the author, you're all done. The order of books is determined by a book’s relevance, the same way your books appear on the Amazon.com Author Page. The most popular books, based on a set of rules designed to provide the best customer experience, appear near the top of the list. We cannot change the order. Remember that customers can sort books in several different orders on the Author Page. If we have incomplete or inaccurate information, we'll ask you if your name is misspelled, if you are not listed as an author but should be, or if you are writing under a pen name. Misspelled name If your name is misspelled, click This is me. We will automatically add the book to your bibliography after verifying that you are the author. Under "Select an issue," select Add a book. Under "Select details," make the appropriate selection. In the field that appears, make the appropriate selection. If possible, send us verification that you have contributed to the book, such as a link to your publisher's website. Pen name If you are writing under a pen name, click let us know under the "Do you have a pen name" heading. We'll ask you what your pen name is, and we’ll contact the book publishers to verify you as author. Once you are verified, you can get to your pen name through the link in the upper right corner of Author Central. This link appears only if you have a pen name listed. 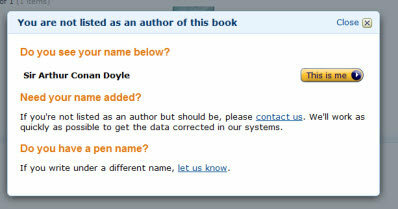 You can manage two Author Pages this way, though they will not be associated in any way on Amazon.com. If you cannot find the book you want to add, make sure it is available through Amazon.com. If the book isn’t listed on Amazon.com, or if we don’t have inventory available, we cannot list it on the Author Page. If anything in the Product Details section of the book's Amazon.com page is incorrect, select your Book on the Books tab of Author Central, and then click Suggest product information updates. If information other than the Product Details is incorrect, contact us and let us know. We will link multiple editions of the same book as long as they are substantially the same item. For example, if you have a novel that was originally released in 1995, and then re-released in 2007 with a new cover and the same content, we can link those two editions so customers are aware of their buying options. Linking editions causes information, such as Customer Reviews, to appear on the detail pages of all linked editions. When editions are linked, a Formats box appears on the book detail page on Amazon.com. If you have a title that you believe should be linked please contact us. Under "Select an issue," select My Books. Under "Select details," select Update information about a book. In the field that appears, select Update something else. In the next field that appears, select I want to link one edition of my book to another edition. Select how you would like to contact us. If a book is incorrectly attributed to you, follow these steps to remove it from your bibliography. On the Books tab, click the title you want to remove. On the selected book’s detail page, click Contact Us at the bottom of the page. Under "Select details," select Remove a book. in the e-mail or phone call, give us the ASIN or ISBN of the title to be removed. We'll review your request and, if appropriate, remove this book from the Author Page within one week. Please keep in mind that we do not remove titles simply because they are out of print. It is our aim to list a wide selection of titles for our customers' reference and convenience, so it is not our practice to remove a listing even when it is out of print. Your Author Page should be a comprehensive list of all editions of your books. Used copies of out-of-print books might still be available.